For a company that cut its teeth making low-tech board games, Days of Wonder has done a surprisingly good job bringing its wares to the technological realm. 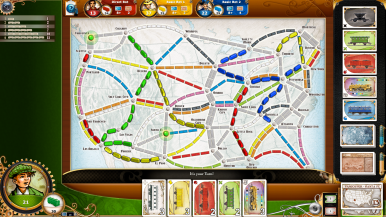 The new version of Ticket to Ride for the Mac, now available in the Mac App Store, is only the latest example. It follows does editions of the popular train tycoon board game for both the iPad and the iPhone, as well as an excellent iPad adaptation of Days of Wonder’s Small World. No training wheels required: Ticket to Ride for Mac looks virtually identical to its iOS counterparts, with more real estate to display all the game's elements. Ticket to Ride for Mac is cut from much the same cloth as its iOS predecessors; if you’ve played either of them, you’ll be right at home. As with the mobile versions, it’s an immersive experience that adeptly duplicates the elements of the original board game in a gorgeous oil-painting-style artwork. The primary advantage of the Mac version is the ability to play Ticket to Ride on the biggest screen yet. Days of Wonder has taken advantage of Lion’s full-screen mode, but that feature will require a display that’s at least 1280-by-720 pixels. Firing it up on a 27-inch display is indeed a thing of beauty: All that real estate is put to good use with elements that in the iOS versions of the game are hidden behind taps or tap-and-holds now out in the open—for example, it requires nothing more than a glance to see how many cards your opponents are holding. Play works much the same way as on iOS, with the substitution of clicking for tapping; I felt as at home playing through a match against a few AI opponents as if I were on the iOS version in which I’ve logged so many hours. In terms of online multiplayer, the options are more akin to those on the iPad than those on the iPhone. Online matches are live, not asynchronous, and since there’s no Game Center on the Mac (until Mountain Lion ships, anyway), all matchmaking is done via Days of Wonder’s own online service. That means that if you want to challenge a friend on the iPad—and yes, Ticket to Ride for Mac lets you take on opponents on Windows, Mac, Linux, or iPad—they’ll need to make sure they have a free Days of Wonder account. I managed to start up an online match against Ticket to Ride for iPad, though I didn’t play it through, since it seemed like playing against myself might in fact be the ultimate challenge. Like its iOS counterparts, the Mac version of Ticket to Ride comes by default with a single map, the classic United States variant. If you want to expand your repertoire to include other options, such as Europe or Switzerland, you’ll have to shell out for those individually, to the tune of $2 each. There’s also an additional pack of variant scoring and game types for the U.S. map which will set you back $1. Those are introductory prices, Days of Wonder says, though the company gave no indication when the prices would rise or to how much. Ticket to Ride for Mac is available in the Mac App Store for $10; it requires Mac OS X 10.6.